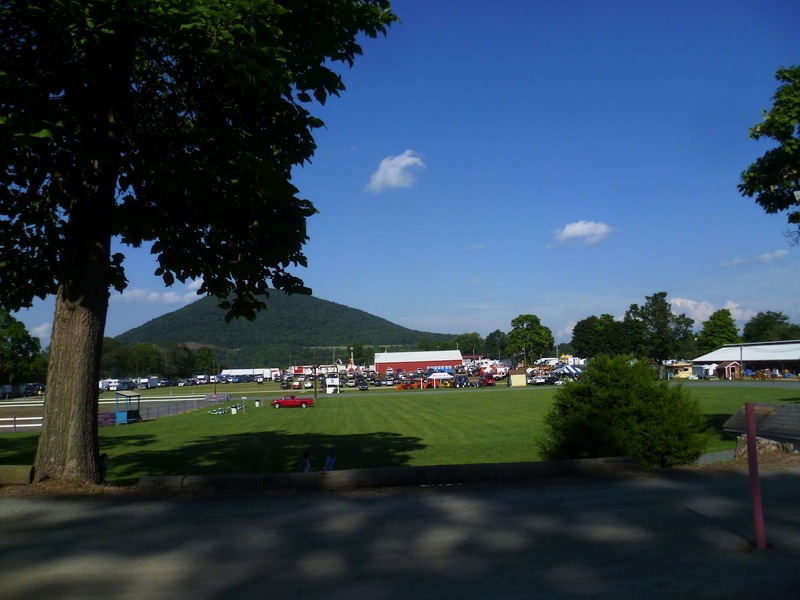 Have you ever been to the Perry County Fair? Well, I hadn’t. Until the other day, anyway. My friend Patti the ag banker (if you need an ag loan— say for that organic heirloom marijuana farm—call her!) was looking for volunteers to work in the Perry County Dairy Promotion booth there. While fairgoers are checking out the farm animals, eating French Fries, and cruising the eye candy near the Pick-A-Duck trailer, the Perry County Dairy Promotion folks sell ice cream and milkshakes to raise money to promote the dairy industry. Patti served on the Arts Festival’s trash crew, and more importantly is a helluva lot of fun, so how could I say no? When I said, “Count me in!” She looked at my artfully producted hair and said, “You gotta wear a hat”. “What about gloves?” I asked, remembering my ten exciting years on the State College Board of Health. She explained that gloves were not necessary since weren’t selling ice cream cones. Even without the chance to work (as my fashionista friends say) the full-on lunch lady look, I was in. So I wore cargo shorts, a blue polo shirt, my special festival/fair Nikes and a Virginia Wahoos baseball cap. 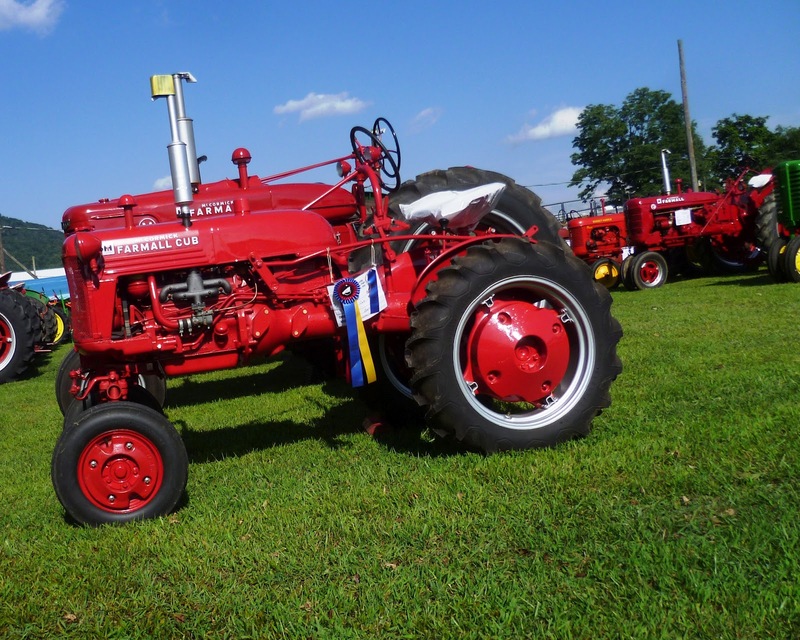 Think of it as Wandering Wahoo summer county fair chic. I thought I looked worthy of a dip or two. Wanna photo? That’s four ride tickets please. For those of you worldwide readers lacking in Central Pennsylvania geography, Perry County is between State College and Harrisburg. Translated into New Jersey-ese, it’s the Newport/New Bloomfield exit on Rte. 322. Or, put another way, it’s the exit with the McDonald’s in the middle of nowhere. 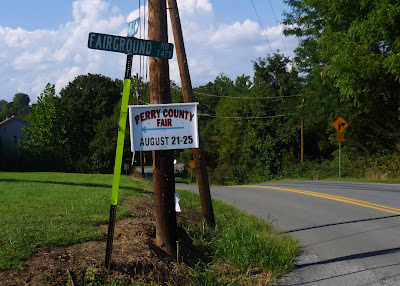 Perry County is named for Oliver Hazard Perry (“We Have Met the Enemy and They Are Ours”) the naval hero of the War of 1812 rather than Luke Perry ("Valerie, I'll only stick it in a little bit.") the anti-hero of Beverly Hills 90210. It’s rural alright. The entire county—all 556 square miles--has just one traffic light. You exit Route 322, pass the McDonald’s in the Middle of Nowhere, and drive down the road to Newport. Right before you cross the Juniata River via one of those old fashioned trestle bridges with a metal mesh bridge deck you pass the Honk if You Love Jesus gas station, which also sells produce. They were having a squash special the other day. I drop lots of F bombs but rarely the L bomb, so even though I am quite fond of Jesus, I didn’t honk. The directions to the fairground were to drive to the four-way stop in Newport and then just follow the signs. It was as easy as homemade, county fair worthy pie. After a short drive through both historic and suburban Newport, it wasn’t long until I was pulling into the concessionaires’ parking area. It occurred to me that although I have a checkered past, I’ve never been a concessionaire before. As I stepped out of my truck, I heard a big whoosh that pretty much scared the crap out of me. I looked around and there on the edge of the fairgrounds was a group of kids (and adults, I learned later) launching model rockets. Yes, model rockets. I didn’t know kids did that anymore! When I was a kid, my brother Rob and I went through a Wernher von Braun phase. We never bothered with the actual rocket body, nose cone, fins, and loading them up with explosives and aiming them at London, and instead just used a piece of coat hanger taped to the Estes rocket engine to turn the engines into bottle rockets on steroids. What they lacked in aerodynamics they made up in immediate gratification. I thought about walking over and checking out Perry County’s home grown Pennemunde, but I had an appointment with an ice cream scoop. On my way to the ice cream stand, I wandered through the not yet humming fairgrounds. 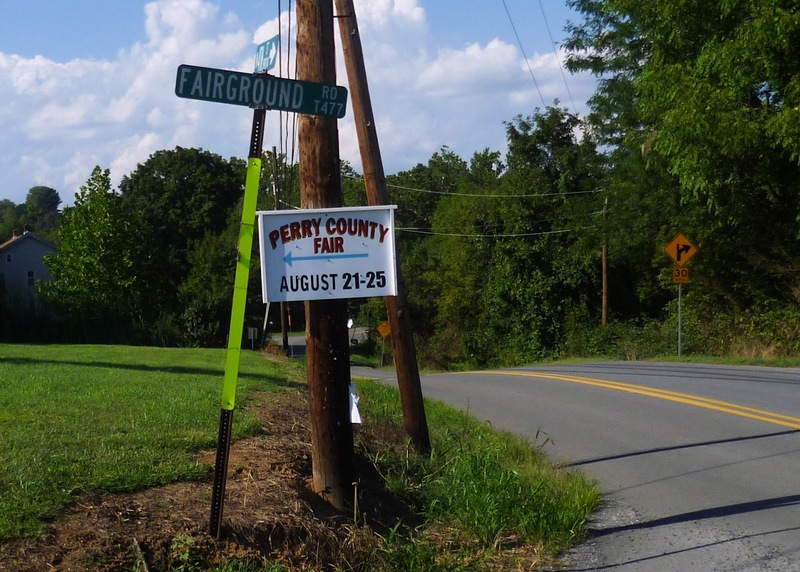 Compared to the Centre County Grange Fair and Encampment, the Perry County Fair is tiny. 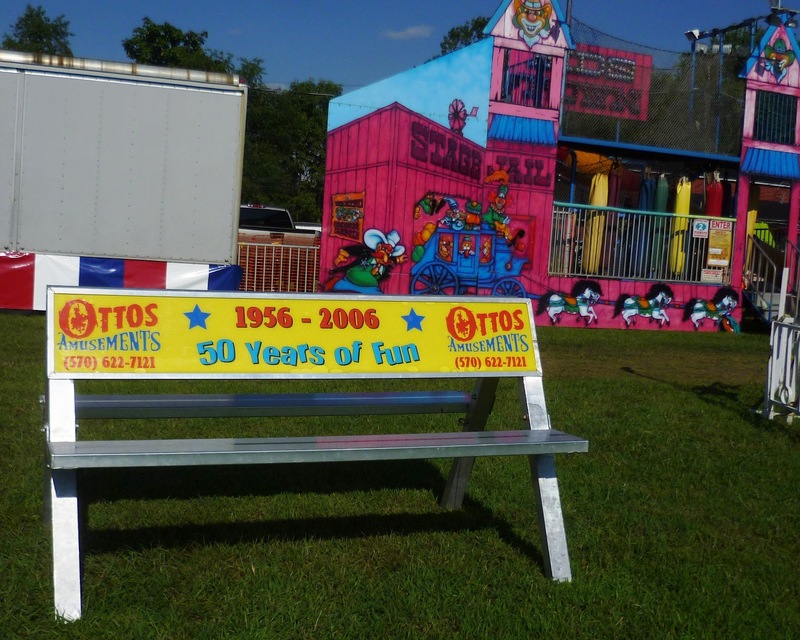 The whole shebang might fit on two soccer fields. There was a vintage tractor display, and of course, there were carnival rides. The rides actually looked clean and safe. I had no clue that rides came in anything other than in a scary and obviously unsafe condition. Things were just starting to open in the midway, but everything was clean, well maintained, and even rather charming. I was beginning to think that I was in Mayberry. 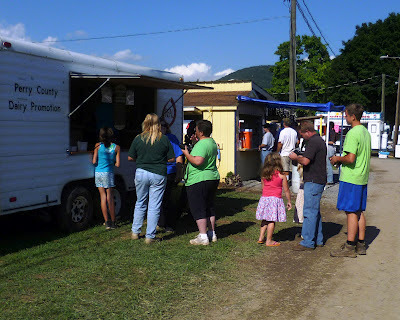 Even with my detour through the midway, I made it to the Perry County Dairy Promotion trailer in plenty of time, since the plumber was still connecting the water line. 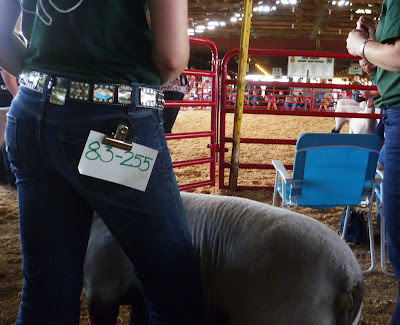 I had a few minutes to spare, so I watched the sheep judging in the nearby barn. All the contestants (as in both 4H-ers and sheep) were scrubbed and neatly dressed, and the parents, grandparents, aunts and uncles crowded around the show rink watching the action. Soon enough we had water and it was time to get the scoop on my job. There were four flavors (chocolate, vanilla, raspberry, and peanut butter) of Hall’s Ice Cream, a locally made, high-butterfat, absolutely delicious ice cream. Patti told me that the milk from her cows (she's a farmer and a banker) could be in the stuff I was dishing out. The serving options were a small dish, a large dish, or a milkshake. Milkshakes and large dishes were four bucks and small dishes were two bucks. Patti operated the heavy equipment—good idea, she probably heard about my escapade with a Segway—while I dished out the ice cream. Patti makes a milkshake the way my father made a highball: heavy on the key ingredient (i.e. booze) and just a splash of the filler. So Patti hit the metal cup with a splash of milk and I filled it the rest of the way with ice cream. The small dish was a scoop plus not quite a scoop, and three or so scoops went into a large dish. We had just gotten into the swing of things when two inspectors for the Pennsylvania Department of Agriculture came by. Inspector #1 (not his real name) was a middle aged white guy, not what you’d call handsome (even at 2:00 am I wouldn’t have looked twice). You knew he was the real deal since he wore a badge on his belt. He was accompanied by inspector #2 (also not his real name), a silent African-American bodybuilder type with forearms like Popeye’s. Inspector #1 did the actual work, while Inspector #2 played the role of the PennDOT worker who stands around and watches everyone else work. Pretty soon we were in the swing of things and there was a steady stream of customers, most of whom wanted milkshakes. Patti knew a bunch of them of course, including the guy in the Crocs and ankle bracelet, who, she told me, was a great, if a tad slow, mechanic. In addition to scooping the ice cream, I promoted myself to overseeing the witty repartee, of which the locals weren’t exactly expecting. They came to buy milkshakes and some went away thinking WTF, it’s the Algonquin Round Table. Yes, I had a blast. In the blink of an eye, my few hours were over and I was replaced with a seasoned pro, Patti’s friend Audra. I don’t think of myself as lucky. I mean, I’ve fruitlessly entered my share of stupid contests and have even purchased lottery tickets when the jackpot was a kabillion dollars. But I’m lucky in the sense that I have good health, a good job, great friends, and of course my wacky family. 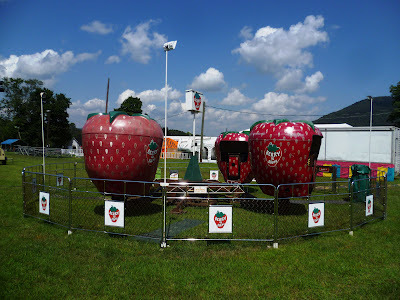 I’m also lucky to have met Patti, and to have enjoyed a memorable afternoon at a quintessential American county fair. I had a super time dipping ice cream, meeting interesting people, and promoting the dairy industry. Now that I think of it, you can’t get any luckier than by being dairy queen for a day.